Have you ever seen photographs of celebrities without their makeup? In many cases the celebrity looks so very different in their bare skin than they do on the red carpet or in official photographs. What makes such a big difference in their appearance? It’s more than just makeup because if all it took was a little makeup you and I would be red carpet ready every time we put ours on. What makes the difference (besides a team of makeup artists)? The secret is highlighting and contouring! 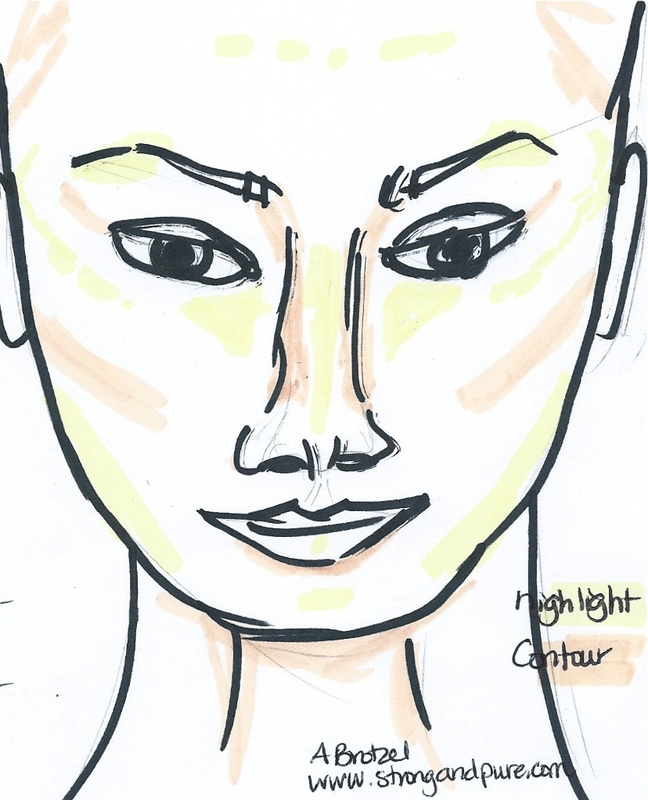 Contouring is simply adding shading to make something recede into the background and highlighting is adding light to bring something forward. Sounds simple enough so where do you begin? To contour apply bronzer wherever you want to create a shadow to make something recede into the background. Make sure to select one that is not too frosty, too orange or too brown. Try applying bronzer just under your cheekbone from mid-pupil to the ear to create a hollow and make your face appear thinner. To make your nose appear narrower apply a little on either side of your nose from your brow down either side of the nose. Contour around your temples, under your chin and slightly down your throat. Blend it well! Use blush that is close to your natural colour on the apples of your cheeks and blend well. To figure out what colour is best simply smile, pinch your cheeks a little and see what colour they are. Remember the right colour may appear too bright and crazy in the container but be the perfect colour on. To highlight apply a highlighting creme with a little bit of sheen to areas you want to bring forward. Right on the brow bone on the outer part of your brows to emphasize your arch. On the top part of your cheek bones and even a little under the eye toward the nose to help camouflage sagging. A must is right along the jaw line to make your jawline stand out and create even better definition of your cheek bones (making you look slimmer). Use the right tools! A fan brush works very well for contouring as it prevents heavy lines and blends the product more easily for a lighter effect. A small concealer brush or eyeshadow brush work well for applying highlighter. Use a big powder brush to blend. Don’t be afraid to try. If you’re too heavy handed on the contouring just blend it away with a sponge or brush and if needed pressed powder to dilute the colour. Grab your smartphone and take a self portrait. You may not have as much colour on as you think. Photos can make your makeup disappear so they can be a good indicator of what others see when they look at you. Most of all have fun and remember your face is unique. Don’t worry about rules and instead make the most the features you have so that you look your best. Like my hand drawn example? Happy highlighting and contouring! I’d love to hear how it goes for you. This entry was posted in Makeup and tagged blush, bronzer, contouring, highlighter, highlighting, makeover, makeup on March 7, 2013 by strongandpure.